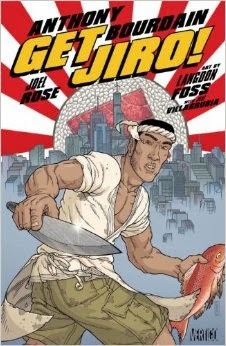 Winged Snail: Review: Get Jiro! The violence in this comic is immediate and unsuspected as chef warlords fight over the restaurant market of the future. The universal importance of food is so extreme that a random gang beating ceases when the victim gets a reservation at an exclusive restaurant and when war breaks out the cops simply discuss their desire for a good steak. Both Bob (representing corporate greed) and Rose (representing moral greed) want Jiro to work for them. Jiro accepts both offers with the intention of starting a war. The result of the war Jiro manages to start is that the restaurant scene returns to one of liberty, with individuals being free to open their own restaurants. It's not utopia though, as customers at Jiro's sushi restaurant still ask for California rolls. I enjoyed this comic. It was the right balance of interesting food jokes/references, food violence, and actual statements on the nature of the food industry. It would be usual for the protagonist to be the vegan moral crusader but by making Rose greedy, exploitative, and economically motivated the comic manages to discuss real issues within the food industry.